With personalized service for a tailor-made experience, stay at Aleph Rome Hotel, Curio Collection by Hilton for its unique and luxurious accommodations. This historic hotel opened in 1930 as the Central Institute of Savings Bank. The bank was closed in the 1990s and it reopened as a hotel in 2003. The Aleph has retained several of the original elements of the bank, including the marble floors, onyx paneling, and vault door. Aleph Rome Hotel, Curio Collection by Hilton features 88 luxury accommodations, including opulent and prestigious guestrooms and suites. Amenities include bathrobes, slippers, a bidet, hypo-allergenic bedding, a pillow menu, flat screen televisions, and luxury toiletries. Guests can enjoy diverse cuisines at any of the five dining establishments at the hotel. Relaxation is imminent at the Salus per Aquam SPA, with blissful treatments and massages available. There is a sauna, steam room, authentic Turkish Hammam, and guests can even schedule a manicure in the spa. Host an event in one of the four meeting spaces that can hold up to 100 guests for a business meeting, wedding ceremony, or cocktail reception. The Aleph can provide event and wedding planners, decorations, and catering. The hotel also offers limo service, two pools, and a rooftop terrace for a luxury stress-free stay. The historic city of Rome has over 2,500 years of history, magnificent architecture, and art for guests to explore. Just minutes away from the Aleph is the Via Veneto, where the classic La Dolce Vita was filmed. Guests can walk to the Spanish Steps and the romantic Trevi Fountain; also walkable is the Colosseum and Roman Forum. Near the hotel are several museums, landmarks, historic areas, high end shopping, and delectable cuisine. Rome hosts several yearly events, such as Giornate FAI and Settimana Santa & Pasqua (Holy Week & Easter). Rome is a one-of-a-kind city with unforgettable experiences available around every corner. 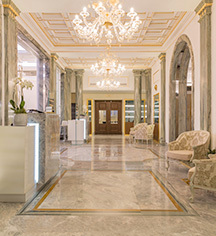 Aleph Rome Hotel, Curio Collection by Hilton, a member of Historic Hotels Worldwide since 2018, dates back to 1930. Aleph Rome, Curio Collection by Hilton is the only place in Rome where guests can experience the traditional Hammam Ritual. ATM: 656 feet/200 meters walking distance from hotel. Cancellation Policy: Depends on room rate. Deposit: 100% for advance purchase rate. Early Check-In/Late Check-Out: Early check-in is 50% of room rate. Late check-out until 6 PM is 50% of room rate. Any time after 6 PM is 100% of room rate. Hotel/Resort Fees & Taxes: There is a city tax of $7.00 GBP per person per day. Occupancy Restrictions: Three (3) adults maximum per room. Restrictions may apply. Pet Policy: €100.00 GPB per stay. Rollaways: Available upon request; €100.00 GBP per day. 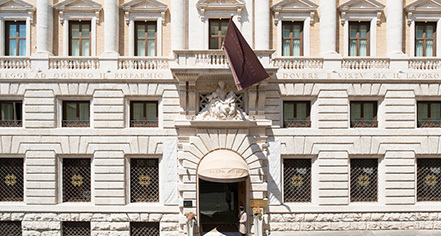 Learn more about the History of Aleph Rome Hotel, Curio Collection by Hilton .